Welcome to October! We haven’t had a chance to write for a while, between ultras, mountains, trail builds, and group runs we have been really busy this summer. I do want to take a minute to let everyone know about some changes to our Board of Directors though. Ron, one of our founders has left the board and is taking his photography to another level with the Ascend Collective. We are sad to see Ron go and we want to thank him for his service to the trails over the past few years. He was so important in the launching of this organization and we would not be who we are today if it were not for Ron. So thank you, Ron. You will be missed! Joining us in his place is a well deserving trail runner. Someone who embodies everything we as an organization stand for. We want to officially welcome Michael Valone as the new Vice President of #TrailsRoc! Michael will be as valuable an asset to this board as he has been to the trail community as a whole here in Rochester. We are excited to see where we go in the future with “Colonel Valone” on board and we encourage you to welcome him with us. There is much going on in the world of trails – We are bringing you the film “Run Free” We have races coming up and of course, as always trail work days. We encourage you to find some time as the colors change to get out with us and enjoy some time off of the pavement! It is with great pride and excitement that I am able to serve as the newest board member of an organization that I absolutely love. Many of you already know me and we have run miles and trails together. If you are new or just getting started in trail running, I hope to meet you soon. Please let me welcome you into what I promise will be a group that you can grow with, laugh with, and learn from. TrailsRoc is the perfect example of what I feel a community should be about. As Eric, Ron, Sean, and Ben have always said, it’s about people and trails. Very simple, yet also at the same time very much needed. I am thrilled beyond belief to be able to serve in this capacity and cannot wait to see you all out there. We hope to put these newsletters out on a monthly basis so you can keep up with all the news and happenings. See you soon. We are happy to announce we are bringing the film RUN FREE- The True Story of Caballo Blancoto Rochester. -The story based on the book Born To Run and its central character Caballo Blanco. Tickets are $12 in advance at www.imathlete.com/events/runfree or $15 at the door the night of the show. Wednesday Evening Run 6:30pm This is the SAS – Night Time Crescent Trail Project. Check out details on the site. # TrailsRoc READY – SET – GLOW – See all you registrants October 10th for a low-key, 5-mile trail run in the dark on the winding trails of Dryer Road Park. Trails will be marked with glow sticks and things that go bump in the night. Finish the race and celebrate with a glow necklace/bracelet, food, and a blacklight party where you can decorate your shirt with highlighters! PACKET AND SHIRT PICKUP AT MEDVED FRIDAY OCTOBER 9th from 5 to 8 pm. The waiting list is still still open and registration closes on October 7th. http://www.trailsroc.org/readysetglow/ Better yet, sign up to Volunteer. Contact us here and let us know if you can help. Each month we will highlight you. A local trail loving runner (or runners). Every other site seems to be highlighting the stars, we want to highlight OUR stars! I’m having trouble finding the words to adequately express the enormity of gratitude and love I feel for TrailsRoc. There is a Danish word, Hygge, for which there is no English translation, but it means a kind of cozy well-being. Like the warm atmosphere created when you mix good friends, good food and good times. Also, something about candles (I’m a little fuzzy on that part). I’ve never been to Denmark but I’m pretty sure I’ve experienced Hygge right here in Rochester. And that is in the community of awesomeness that is TrailsRoc. My life has been forever changed and infinitely improved by the experiences and especially the people I’ve met through TrailsRoc. I found the most inspiring, encouraging and straight-up badass friends. Without TrailsRoc, I wouldn’t have found my awesome roommate/friend, Danielle nor my life & adventure partner, Pete. Funnily enough, both of those things happened due to lost keys. I had met Danielle through TrailsRoc runs and races, but I really got to know her during one Saturday run at Mendon when she lost her car key in the woods and we got lost together trying to find it. We didn’t find her key that day, but we did find kindred spirit tree climbers in each other. I met Pete through the TrailsRoc group runs and volunteering at the TrailsRoc 0spf half marathon. After a preview run for the Mess The Dress race, Pete “accidentally” locked his keys in his trunk, so I gave him a ride home to get his spare key and then back to Black Creek Park to get his car. He bought me ice cream from a gas station. Mess The Dress 2014 was our first date. He asked me to be his girlfriend during the Flower City Half and to be his wife at Crater Lake in Oregon after we’d run 42 miles on the Rogue River trail. We just got married on September 6th at Powder Mill Park, site of the TrailsRoc WTF race. In my very humble opinion, The Secret To Life, is this: fresh air & good company. And I’ve found both of those things in TrailsRoc. It’s a community of people who challenge themselves and others to test their limits and push past them, who are there to celebrate the good times and give you hugs during the bad times, who always have time for one more hill. Meaningful relationships are the true riches of life. And I hit the jackpot when I joined TrailsRoc. So the legendary Michael Valone asked me what TrailsRoc means to me. It means good friends, good runs, good times. It means a community of people who live as if no dream is too big and nothing is impossible. It means the world to me. I knew immediately and very powerfully the very first time I ran on a trail through the woods that this is where I belonged. I love the smell and peacefulness of nature and the experience of trail running and I am not alone. What Traisroc does is bring people who love the trail running experience together to form a community of shared values and desires. We all can forget about both our differences and similarities and just run the trail. I believe and have witnessed that with Trailsroc everyone is welcome and encouraged to participate. Running trails with Eric, Shelia, Steven(s), Todd, two-n-Jenn, Bob, and Alison and the rest of the Trailsroc community is how I met my wonderful wife Jen, without whom I wouldn’t have the desire to be better and better together. 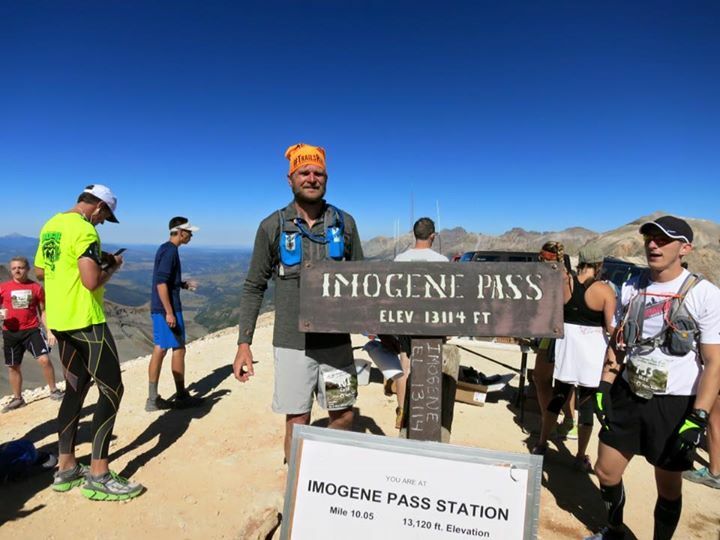 Colin Bailey is our current merchandise elevation holder at 13,120 feet during the Imogene Pass Run from Ouray to Telluride. Colin decided to forego the shirt and wear the new signature buff. Way to rep Colin!!!!! !